URUMQI, China -- Urumqi, the capital of northwest Xinjiang Province, is a city that operates on two clocks. Trains, planes and business hours tend to correspond to "Beijing time," while many locals instead set their schedules according to "Xinjiang time," two hours behind official clocks but closer to the natural rhythms of the landscape. Time zones aren't the only thing that separates this remote province from the rest of China. As the home of China's Uyghur ethnic minority and a mashup of other central Asian groups, Xinjiang is a world apart culturally from the rest of the country. Most Uyghurs practice Islam and speak a Turkic language indecipherable to members of the dominant Han ethnic group. Those religious and cultural divides are just one aspect of the increasingly fraught relationship between Uyghurs and Han in Urumqi, where tensions have exploded in deadly riots and terrorist attacks. Even without the violence, the communities inhabit largely parallel universes, and rarely is this clearer than during Chinese New Year. While Han Chinese drop everything and journey to their hometowns for once-a-year reunions, most Uyghurs ignore the holiday entirely. The photos below portray Uyghurs and Han in Urumqi on New Year's Eve and New Year's Day. All photos by Matjaž Tančič except where noted otherwise. Crescent moons adorn lamb barbecue stands on a busy street in Urumqi's Uyghur Tianshan district. Mannequins outside a Uyghur storefront in Tianshan district. Storekeepers at Urumqi's Grand Bazaar dressed in traditional Adidas and Louis Vuitton headscarves. Urumqi's local government has instituted strict bans on face-covering veils and long beards on young men. A musical young couple lines up to buy decorations for Chinese New Year. Uyghurs adhere to religious injunctions against eating pork, but lamb butchers and skewers are abundant in the city. Young men and women dance at an underground Uyghur club on New Year's Eve. A Uyghur man dancing to local ethnic music in the hours before midnight. Police on patrol in Tianshan district. A spate of knife and bomb attacks have attracted a large and heavily armed police presence throughout the city. 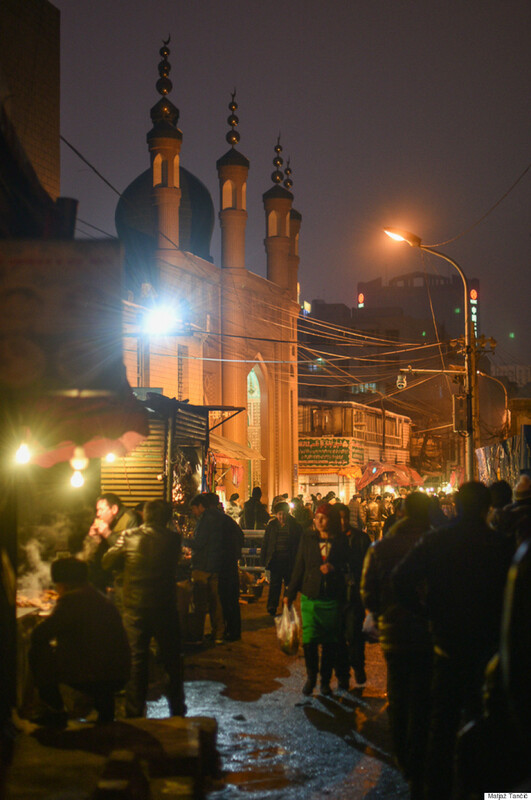 While many Chinese restaurants close their doors for weeks, this Uyghur night market remained lively on New Year's Eve. Children pose for photos on the morning of Chinese New Year. A young Han Chinese boy visits Red Mountain Temple in Urumqi on New Year's morning. Military police guard People's Square on New Year's morning. A massive firecracker explosion marks the New Year at an Urumqi mall. Workers clean up the aftermath of the massive firecracker display.